We've spent a bit over an hour on the ground in Phuket, before reboarding our plane yet again for the leg to Bangkok. We arrived at Phuket just before 06:00 in total darkness and watched a rapid tropical sunrise push shades of grey over the tarmac we could see outside the transit lounge windows. There wasn't much to see except a line of trees beyond the plane and a glimpse of sea, while inside we had an array of airport shops not yet open for business. They slowly opened as we sat waiting, bleary and tired. We arrived in Chiang Mai a little after midday, after changing planes and having a couple of hours in transit in Bangkok. A nice Thai woman who introduced herself as Patty (unlikely to be her real name) met us at Chiang Mai airport with out arranged airport transfer to our hotel - the luxury of having a wife who works for Royal Orchid Holidays! Patty was impressed with my one sentence of Thai (sawàt-dii khráp - "hello") and thought I knew the language. After explaining in English that that was currently the extent of my Thai, she herded us into a nice air-conditioned car. This was really cool after the steaming conditions out of doors which we had had to endure on the tarmac at Bangkok. Both leaving our inbound flight and boarding our Chiang Mai connection we had to use buses ferrying us between the temrinal and plane, and cross the last bit of tarmac on foot. The heat and humidity here in Chiang Mai is also formidable. The driver took what Patty explained as a "short cut" to our hotel, avoiding the main streets, and I'm glad he did. The street he took us down was narrow and a bit winding, weaving its way between ramshackle buildings and amazing Buddhist shrines and temples. The street was barely wide enough for our car, but we also competed with oncoming traffic as well as motorcycles that overtook us and tuk-tuks that we overtook. It was my first real experience of Asian traffic and a packed Asian street, and was simply an incredible feats for the senses. Patty helped us check in at the Suriwongse Hotel on Loi Kroh Road. This is marked as a fairly major road on our map; in reality it is one way and barely two lanes wide when one driver impatiently tries to overtake another. The drivers here are a whole new level beyond the craziness we saw in Rome. We dumped our stuff and had quick showers to refresh ourselves after the flight. Then, although exhausted, we were excited to go walking and get our first street level taste of Chiang Mai. We decided to do a loop west along Loi Kroh Rd, continuing on to Wat Phra Singh - the main Buddhist temple in Chiang Mai - then back east along Tha Phae Rd. The walk along Loi Kroh took some time, with us being distracted by numerous small handicraft and clothing shops, as well as eating places. We also got distracted by the amazing Wat Loi Kroh, at which we stopped to have a look around, entering its grounds. There were monastery accommodations for monks and some spectacular temples, richly and colourfully decorated. We'd been expecting some water spraying from the locals with the impending Songkran (Buddhist New Year) festival, at which the spraying of water is a tradition, but with the official start not for two days we hoped it would be low key and not too drenching. We received a few small sprays and one young woman tipped small buckets of water down our sides. I hadn't prepared for this and my camera was vulnerable so we picked our way westwards carefully, as far as the large square moat surrounding the old town area. Here, hordes of young people were drenching anything that moved with buckets of water drawn from the moat. We decided to backtrack down some back alleys (an experience in themselves!) and returned to Loi Kroh Rd heading back to our hotel, having only covered half the distance to our intended target of Wat Phra Singh. By now we were hungry - it was about 14:30. We stopped at a small cosy-looking local restaurant called The Family Place. It turned out to have several garden tables out the back, under shade and in a nice cross breeze that tempered the afternoon heat. We ordered "wet" noodles after a bit of back and forth in extremely halting Thai and English, pork for me and egg for Michelle. They arrived with the traditional four pots of condiments - ground chili, sliced chilis in vinegar, what looked like peanut oil, and sugar - all of which I tried mixing into mine. 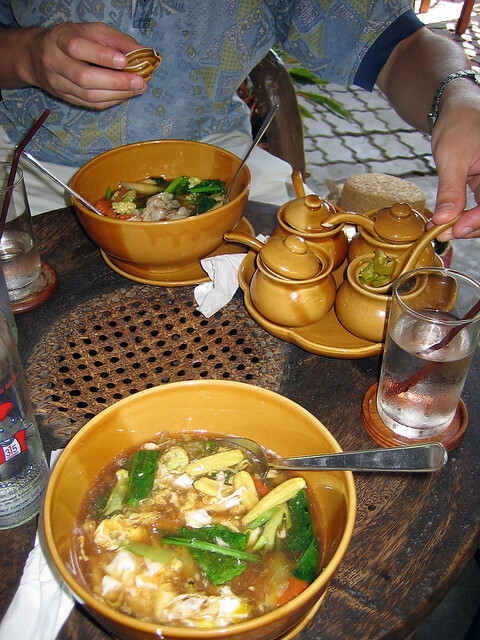 The dishes were a watery broth, thick with large, flat noodles, vegetables, and meat (or egg in Michelle's case). It was truly delicious (and hot with all that extra chili in it), and not just because it was our first non-airline food for a day. Even better, with two bottles of water to drink it cost us the grand total of 90 baht - about $3. As we ate, lazy cats lounged under some of the nearby tables, out of the heat of the day. After this delicious meal, and practising a bit more of my Thai as we left, we headed back to our hotel, taking a route south around the block to see some more sights. We stopped briefly at an indoor air-conditioned mall sort of thing that appeared to have nothing in it but electronic goods shops. I withdrew some money at an ATM, after the first ATM I tried didn't recognise my Visa card. Then we walked north up Chang Klan Rd back to our hotel, to find stalls being set up along the street for the night market. We browsed a little then headed back for some rest before checking out the markets once the stalls had all been set up for the evening. Back at the hotel, I had a swim in the pool to refresh myself from the heat and get some energy back. Then Michelle had a nap while I wrote this diary entry. And just a few minutes ago it started to rain. We are back at the hotel after another excursion, this time exclusively to sample the delights of the Chiang Mai night bazaar - which fills about a dozen city blocks right around our hotel. We walked up and down Chang Klan Rd, which seems to be the centre of all the activity. We passed stall after stall after stall, lining both sides of the street and packed with wares to sell without a gap between. The effect was to make the footpath a tunnel between the stalls and the buildings, with almost no access to the road. Many stalls had roofs too, to keep off the intermittent rain that fell as we browsed. The tunnel effect cut off the faint breeze and the rain just made things more humid. Soon we were fanning ourselves with a copy of Nancy Chandler's Map of Chiang Mai and relishing the rare breaks in the stalls where some breeze entered to cool our sweat-soaked bodies. After an unsuccessful attempt to locate a supermarket from the map, we trekked back south along Chang Klan Rd to look for food. We found a banana roti vendor by the intersection near our hotel and bought one each - delicious! It was flat fried bread wrapped around sliced banana, all cooked on a hot plate in front of us; I had sugar and condensed milk on mine. Then we found some dried fruit and nut sellers and Michelle got some dried mango and cashews for a snack. The cashews were unsalted and came with salt in a little packet inside the bag - why can't we get nuts like this back home? We approached the Anusarn Market, which is a vast area covered by open air restaurants and food vendor stalls. We tried a sample of fresh mangosteen from a friendly vendor. I asked if she had any chom-phûu (rose apple), which Michelle had tried and liked on the plane, but they were out until Wednesday. So we got some fresh sliced rockmelon instead. Since we were already mostly full of banana roti, we skipped a sit down dinner and I got a sliced spicy pork sausage from a vendor, which was sliced up for me and came in pieces in a bag with a bamboo skewer to eat it with. It was delicious; spicy with chili in it.